Click on the map above to go to the interactive map. After a prolonged hiatus, we are pleased to announce the re-launch of the Seattle Fascist-Watch Map. 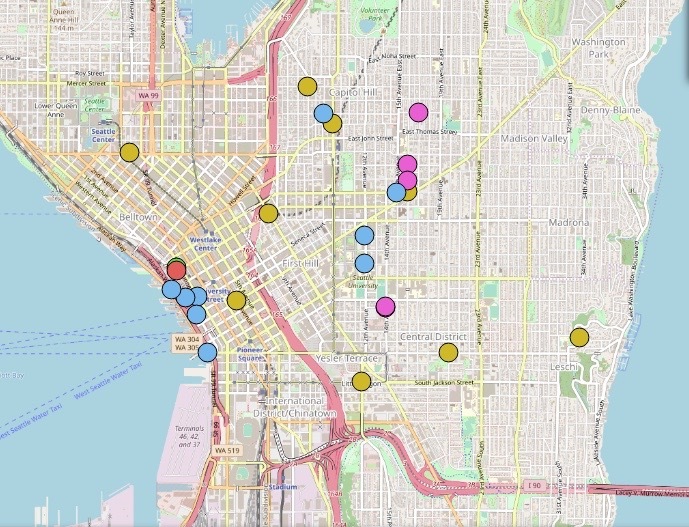 This map was originally launched in 2016 with the intended purpose of documenting the spread of fascist propaganda in and around the Seattle area in a medium that was immediately accessible for the public to use however they wish. We have seen a handful of organizations, be they journalists or non-profits, solicit themselves for people to provide information on hate-crimes and propaganda to be tracked, but when is that information made of use to the people most directly affected by it? A report by the Anti-Defamation League recently stated that there was a rise in white supremacist propaganda efforts in Washington state in the last year, but that only 44 incidents had been reported in 2018. As anti-fascists on the ground in this struggle in this area, we know that there must have been far more incidents of fascist and white supremacist propaganda in our neighborhoods and communities. Again, the aim of this map is to provide information about fascist and white supremacist propaganda in the Seattle area. One of the most important parts of this map is the legend, as well as the archived map of propaganda from previous years. In the top right corner of the map, you’ll find a drop-down menu that reads “Map & Tools.” Click on that, and select “Layers & Legend.” There, you can select and de-select “archive” or “current” to reveal blips on the map for propaganda that have gone up since halfway through 2018 (current), or propaganda that has gone up between 2016 up through the first half 2018. Hovering your mouse next to the words “archive” or “current” will reveal the legend, indicating which fascist group is affiliated with which color on the map. This anti-fascist mapping project is dependent on all of the comrades in the streets, walking to and from work or school or just around the city, taking pictures and documenting fascism, rather than turning a blind eye and ignoring a very real threat to our communities. No pasaran!